Is the Naked Wedding Cake Waning? It certainly doesn’t seem that Naked Wedding Cake popularity is waning, so here at Sticky Fingers Cake Co I thought I’d hold our very own naked wedding cake Q & A session… hopefully I’ll answer any question you may have but if there’s anything I haven’t covered then just contact me through the usual means and I’ll get straight back to you! Q: Won’t the cake be dry? A: I get this question a lot and the answer is NO. The cakes are protected by their crust on the outside, so until you cut the cake it’ll be as fresh and lovely as usual! Q: Can we have any flavour cake? A: Yes, pretty much any cake can be used in a naked wedding cake. The only flavour I would be dubious about choosing would be the Traditional Fruitcake and this is only because of the aesthetics of the cake. You would normally layer the cakes using jams and buttercreams and you can’t really do this with a fruitcake. Mind you, it would be really cool have a fruitcake as your base, iced to look like a tree slice cake stand! 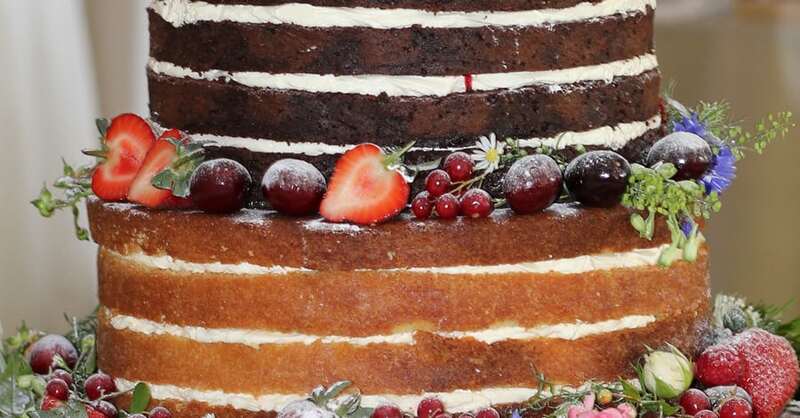 Q: Is a Naked wedding cake suitable for all venue types? A: There are no hard or fast rules for which type of venue suits the naked wedding cake. In Essex and Suffolk, we are spoilt rotten when it comes to venues, but a barn venue like Blake Hall in Ongar, Essex or Smeetham Hall Barn in Sudbury, Suffolk are perfect. Having said that I delivered one to The Old Parish Rooms in Rayleigh, Essex the other day and it looked perfect there too! Q: Can we have flowers instead of fruit to decorate the cake? A: Absolutely! Fresh flowers look beautiful on a naked wedding cake but you do have to be careful with what flowers you have because of their toxicity. Your florist will be able to advise you on that. We like to arrange the flowers on the cake ourselves so we would liaise with your florist nearer the time of your big day for them to supply the flowers and we would set up the cake and arrange them at the venue. Q: How much would I expect to pay for a naked wedding cake? I think that’s covered everything but please contact us if you have any more questions.